Made possible by a National Fish and Wildlife Foundation (NFWF) grant. Rain Gardens reduce flooding and storm water pollution, improving water quality in our streams and rivers for aquatic life and recreational users. Bring on the Rain! The spring 2016 Garden near the headwater of Naylor’s Run is doing its job with room to spare while Prescott Road is underwater during a July 18 deluge. Beautiful landscaped areas built down, instead of up, intercepting runoff from buildings, driveways and other impervious surfaces before it can reach the storm sewers and streams. 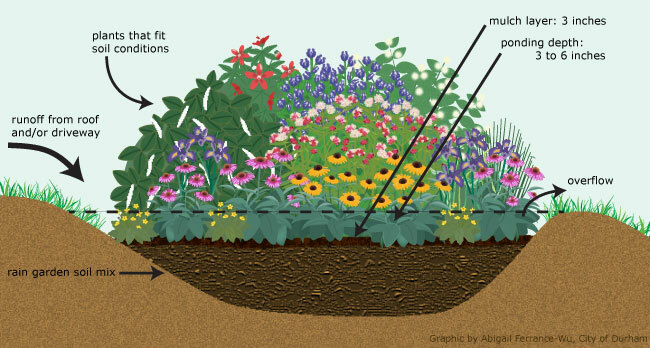 Small gardens are typically 6-12 inches deep and drain within a day or two after a rain. Plants are water and drought tolerant and need little or no watering after they are established. Request a rain garden or collaborate with us on integrating rain gardens into the STEM curriculum. This year we are emphasizing the Naylor’s watershed area and will give priority to requests from this area. Ask for a Rain Garden: Homeowners in Haverford and small businesses in the Naylor’s microwatershed who want a rain garden can contact havaraingarden@gmail.com (note if you are in the Naylor’s watershed area). More information can be found at www.facebook.com/HaverfordRainGardens. Adopt a Rain Garden: Businesses can “Adopt a Rain Garden” - maintain a public garden, build one on your property, become Hav-a-Rain Garden sponsors or contribute. Email us to learn more about becoming a sponsor. Landscapers, Landscape Designers, and Builders: The best way to learn is by doing. Hav-a-Rain Garden invites landscapers, landscape designers and builders to come out and join us to learn what its all about. Interns: College students and High School seniors seeking internships can help in a wide variety of ways, ranging from creating web-based design libraries to outreach to assisting in managing the program. Schools: Integrate practical application of environmental science, math, geology and biology through teaching about, designing, building and maintaining rain gardens right in your own backyard. Take Your Opportunity to Help! Every day new landscaped areas are built “up” instead of “down”, driveways and impervious patios are built or expanded and new homes and driveways are built creating more runoff and contributing to stream pollution and flooding. Take the opportunity and improve our watershed – instead of degrade it. Start a Rain Garden program in your town via a Hav-a-Rain Garden apprenticeship! Build and maintain your own garden! Help to Protect our Waterways!